A Brazilian armed forces member patrols, during an operation against drug gangs, in the Lins slums complex in Rio de Janeiro, Brazil, March 27, 2018. Leaders of Rio de Janeiro's heavily armed drug gangs agree on at least one thing with the head of Brazil's army: An ongoing military intervention cannot solve the soaring crime and violence that is roiling the seaside metropolis. "Will the army break this cycle of violence?" asked a leader of the Red Command, Rio's most powerful drug gang, on a recent weeknight as deputies weighed marijuana and cocaine on a digital scale in a slum from which they operate. "Not a chance." The comments, made to Reuters during a rare visit to leaders of Rio's two most influential drug gangs, came two months after President Michel Temer deployed 30,000 troops here, saying organized crime had "taken over Rio de Janeiro." A Brazilian drug gang member checks his mobile phone in a slum in Rio de Janeiro, Brazil, March 19, 2018. The gang leaders are admitted criminals wanted by police for their role in drug violence. Their viewpoint, which Reuters sought in an effort to understand both sides of Rio's violent divide, reveals organizations that are unapologetic about their criminal activities but not likely to attack a military they see as a temporary inconvenience, at worst. "Nothing will change," said a leader of the Pure Third Command, Rio's second most powerful gang and the archrivals of the Red Command. He said he might lie low during the intervention but his foot soldiers would keep selling drugs. "I will return and get back to work when they leave," he said. Two months into the army's 10-month deployment, this metropolitan area of more than 12 million people is even more tense than before — riven by the recent killing of a prominent city councilwoman and, days later, police killings of eight young men in Rocinha, Rio's largest slum. 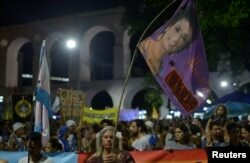 Demonstrators take part in a protest against the shooting of Rio de Janeiro City Councillor Marielle Franco one month after her death, in Rio de Janeiro, Brazil, April 14, 2018. The killings added to a mounting toll of homicides that spiked after a recent recession gutted Brazil's economy and Rio's public security budget. In just three years, as police went unpaid and ill-equipped, violent deaths here surged 35 percent, according to state figures. Although violence has plagued Rio for decades, the rate is the grisliest of many indicators once again despairing locals. Before the recession, many thought Rio had finally turned a corner, booming with offshore oil and successfully hosting the most recent summer Olympic and World Cup competitions. 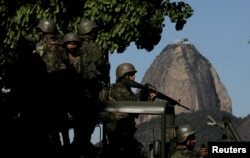 Now, even the head of Brazil's army, General Eduardo Villas Boas, says Rio should not expect a quick fix for violence that pits underfunded police against drug gangs and paramilitary militias that control large swaths of the metropolitan region. In March, the first full month with the army in charge of security, 191 violent deaths were reported within Rio city limits, a 24 percent increase from February. Police killings of suspects jumped 34 percent in the same period. While the military will work to restructure police ranks and root out pockets of well-documented corruption, real solutions must be "extremely long term," the general said during a March briefing. Rio's problems stem from "decades and decades of neglect and not meeting the population's basic needs," he added. A Brazilian drug gang member poses with a gun in a slum in Rio de Janeiro, Brazil, March 17, 2018. Nearly a fifth of Rio's population lives in favelas, sprawling slums where many go without basic water, sewerage or garbage services. Favelas are home to millions of law-abiding citizens but also, because of the lack of state presence, Rio's most powerful drug gangs. Despite their role in the drug trade, which ravages communities and spawns bloody turf wars, the gangs have long provided authority where the government does not. The gangs are tolerated, even welcomed, by many residents fearful of what they see as trigger-happy police. The March shootings in Rocinha were typical of the grim contradictions that often surround Rio law enforcement operations, many of which are never fully investigated. While police claimed the young men were drug traffickers, their families denied any gang connections. Reuters recently spent three days and nights in the redoubts of the Red Command and, separately, the Pure Third Command. Their leaders, who spoke on condition of anonymity and asked that their precise locations not be disclosed, discussed the military intervention and the large social divide that in many ways empowers them. They did not discuss specific crimes or recent incidents. Scores of subordinates, armed with pistols and AR-15-style rifles, guarded streets around both hideouts. Neither soldiers nor police, who retain responsibility for most street patrols and other day-to-day law enforcement, were anywhere nearby. Brazilian marines patrol the streets of Botafogo neighborhood with Sugar Loaf mountain in the background in Rio de Janeiro, Brazil, April 3, 2018. The Red Command leader, who started as a gang lookout three decades ago at age 11, said he expected little interference during the intervention. Deployments in 2014 and 2016, when soldiers supplemented police forces while Rio hosted the World Cup and Olympics, barely affected business, he recalled. "They tried before," he said. "There was no real impact on violence or our ability to operate." That is in part because the gangs, who often have superior armaments to police forces, hail from and are the de facto rulers of many of Rio's roughly 1,000 favelas. They not only control the drug trade but also have the authority, especially in moments of conflict, to order businesses and schools to close. "To truly attack us, they have to turn this into an urban war," the Red Command leader said. "The gangs, no matter which, are part of the favela. We come from it and blend into it, are part of the fabric. How are they going to pull that apart without a slaughter?" The Pure Third Command leader, speaking to Reuters in a favela 25 kilometers (16 miles) away from the Red Command-controlled slum, said the previous deployments made it clear to gangs that they, after frequent armed clashes with police, are more seasoned combatants than troops. After all, Brazil's army has not waged war in nearly 150 years. "Soldiers are inexperienced kids who have seen a lot less fighting than we have," he said. "They do not really want to come after us." Brazil's army did not respond to requests for comment beyond those already made by the general. But security experts not involved in the intervention agree with the gangs' assessment. At most, they say, the army can help Rio authorities analyze the problems of a police force known as corrupt, violent and ineffective. "The best thing that can come from this is that the army gives a comprehensive diagnosis of the challenges," said Paulo Storani, a former Rio police commander who now works as a security consultant. In the chaotic streets of the favelas where the gangs operate, the challenges are not hard to see. Trash piles up along pothole-filled roads, where a din of engines and high-pitched horns blares from motorcycles dodging pedestrian traffic. In the slum where Reuters met the Red Command leader, a group of young boys, shirtless and shoeless, chased each other. They held makeshift pistols carved from white foam packaging. A few yards away, a group of teenage boys brandished the real thing. Some straddled Kawasaki motorcycles, others leaned against cars, Glock 9 mm pistols holstered to their hips. "We are left on our own here," said Flavia Rocha, 26, a mother of two who runs a small grocery store nearby. She lamented the quality of government across Rio, a city and eponymous state where every governor elected in the last two decades has been convicted of corruption, faces criminal charges or is under investigation. "And people wonder how criminals came to dominate these areas," she said. As Rio's institutions have crumbled, the gang leaders said, their factions have grown stronger. Not only have they been able to reclaim territory that police forces had occupied before the recession, gangs no longer feel on the defensive. "If the police come in, we are stronger than before and can combat them with even more force," the Pure Third Command leader said.